For most of its history, the northeast corner of Division Street and Broadway has been focused on serving guests. Stately elms line the corner of Broadway and Division Street, providing shade for guests of the Worden Hotel in the early 1900s. Original print by Detroit Publishing Company. For most of its history, the northeast corner of Division Street and Broadway has been focused on serving guests who come to visit Saratoga Springs. In 1832, the Saratoga and Schenectady Railroad Depot was built on this corner in the village of Saratoga Springs. Also on the site was the aptly named Railroad House, built that same year. 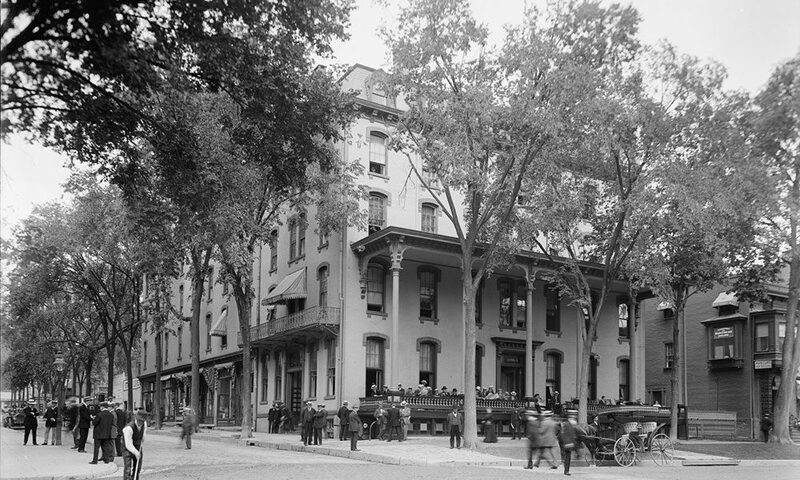 The Railroad House operated until 1853, when the owners demolished the hotel and built a new one, naming it the Marvin House, after one of Saratoga’s most prominent families. The original Marvin House was destroyed by fire in 1865, but was quickly rebuilt. The new building was a five-story structure and, with 300 guest rooms, was the largest in Saratoga at the time, encompassing the entire lot with its large veranda. In 1882, new proprietors took over the Marvin House and renamed it the Arlington Hotel. In 1883, William Worden leased the Arlington and then purchased the hotel, renovating it for $100,000 and renaming it The Worden Hotel. Sometimes referred to as the “New Worden,” the hotel opened on Jan. 19, 1885. Many conferences and gatherings were held in the Worden, including the first meeting of the New York State County Highway Superintendents Association, in 1909. The hotel was one of the few in Saratoga Springs with a central steam heating system, so it could operate year round. Most hotels only operated during the summer. Because of this, over the years the Worden became a sort of “hometown hotel” where locals gathered in the downstairs bar and adjacent grill, whatever the season. Many famous Saratogians of the era — actor Monty Woolley (1888-1963), a local resident best known for his role in the play and film The Man Who Came to Dinner, New Yorker contributor and humorist author Frank Sullivan (1892-1976), and their local cohorts — were regulars at the Worden Hotel bar. Sadly, in 1961, like so many of the large hotels, the Worden was damaged by fire and closed indefinitely. By 1963, the decision was made to tear down the hotel. A new “modern” two-story hotel, with an indoor pool and parking in front, was constructed. First called the new “New Worden,” the Saratoga Downtowner has been a fixture on the corner of Broadway and Division Street for just over 50 years. With such a central location, the site has s been a perfect spot for a hotel for almost two centuries or more, for visitors who want to stay near all the activity on Broadway, whatever the era.